When is a smartphone a phablet? 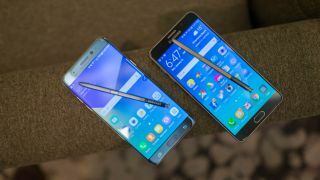 With phone display sizes getting bigger and bigger, the biggest way of distinguishing between Samsung's Galaxy phones and Galaxy Notes has been the stylus support for the latter - but that could be about to change over the next 12 months. Rumors coming out of China are suggesting that when the Samsung Galaxy S8 shows up, it's going to come with the option of an S Pen accessory, the stylus that until now has been exclusively bundled with (and integrated into) the Note devices. In fact, reports suggest that some Galaxy S8 prototypes did indeed feature an integrated stylus. Apparently that idea has now been shelved, but you can still pick up an S Pen as an added extra to use with your S8 phone. So what does this mean for the Galaxy S8 and indeed the Note 8 - if the rumors are true? It might point to an even larger pair of screen sizes for next years phones, and the 5.7-inch and 6.2-inch display size points have been mooted. It could also suggest that Samsung is planning to ditch the Note series completely and focus all of its attention on the phones - one of which would effectively become the new Note - though that does contradict earlier reports. Based on what we've heard so far, it sounds like Samsung is intent on pulling out all the stops to make sure its 2017 is much better than its 2016 was. In the meantime you can keep up with all the Galaxy S8 rumors here. Could battery issues cause a hold-up for the Galaxy S8?